The Scottish FA's lease on Hampden ends in 2020 and the governing body is currently considering all its options in consultation with stakeholders in the game. A survey of 2,923 fans by the Scottish Football Supporters Association found that 15% wanted to retain Hampden as the national stadium. Murrayfield, the home of Scottish rugby, is one potential alternative. Others involve playing major games around the county. BBC Scotland canvassed the views of players, managers and former players, with a range of views on the best option for Scottish football. "I would look at other options. There are certain matches that need to go round the country, where we have some fantastic stadiums. I don't know why we need to play all our matches there." "I'm all for [Hampden]. I'm a traditionalist that way. I've got some really good memories of Hampden, some not so good, but I do feel that it's something we should cherish. "There's nothing wrong with taking certain international games round the country. We can make Hampden better in terms of atmosphere, but I would want to have Hampden there rather than lose it." "I'm not really too bothered. I'm not a traditionalist. Hampden has been a great stadium down the years, people who have played there will have great memories, people who have gone to watch will have great memories, but times move on. If it's time to change, it's time to change. But if it's also decided to stay at Hampden, that's not going to be a bad thing either. "I enjoyed [Murrayfield] because we won [when Kilmarnock beat Hearts], but it is a rugby stadium, historically. There are many arguments, and money will talk. Whichever is most cost effective will be the hub of the decision." "I've played in some very big cup finals - and blessed to win a couple there - and it's good, but I believe it misses something. I'm all for nostalgia and history, but I wouldn't be bothered if we moved our games to Murrayfield. That's a terrific stadium, there's a case for it. "I've heard that an awful lot. I know Murrayfield has a big track round it, but there's something extra about it. Hampden hasn't got it, and I've played in Old Firm cup final wins where it was a brilliant atmosphere. But there's just something missing from an Ibrox or a Celtic Park, and a Tynecastle. I wouldn't be bothered by a move." "From a players' point of view, I've had some great memories there, it's a special place for me. I'm a big fan of Hampden, it generates a great atmosphere when it's full. I can understand why some games, like the friendlies, you could move them away to places like Tynecastle, Pittodrie, when it will be a lower crowd. But Hampden should be used as the national stadium. "The games I've played in, it certainly compares. I think back to the big games for Scotland and the atmosphere was excellent. I've played in games at Celtic Park for Scotland and the fans are the same. "You go there for the semi-final and the final of the cup, and that's when you say, 'we're going to Hampden'. It's a special place. I get that there's a running track and for fans behind the goals it can be difficult. Can we redevelop it, bring the seating closer? I don't know if that's an option. 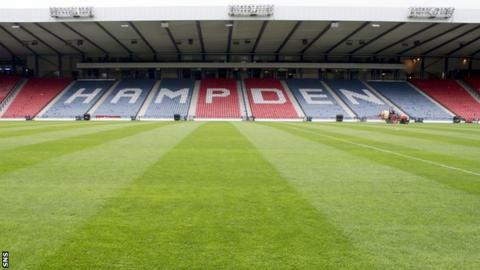 There's so much history there and I'm a big fan [of Hampden]." "Our record isn't fantastic at Hampden. Having experienced a cup final at Celtic Park, that was incredible, so I'm all for moving it to the likes of Celtic Park, Ibrox, even Tynecastle. Obviously we've experienced Murrayfield and it was half-empty but still not as good. Celtic Park would be a great choice." "I lived in the Gorbals, not too far from Hampden, and I've been there many times. For me, it's always been a wonderful occasion. I don't see why it should change from being the national stadium. "When the Tartan Army are in full [voice], it's there for everyone to hear. I was fortunate to play in a cup final there for Airdrie and there was a terrific atmosphere. Everyone has an opinion, but it should always be the national stadium."